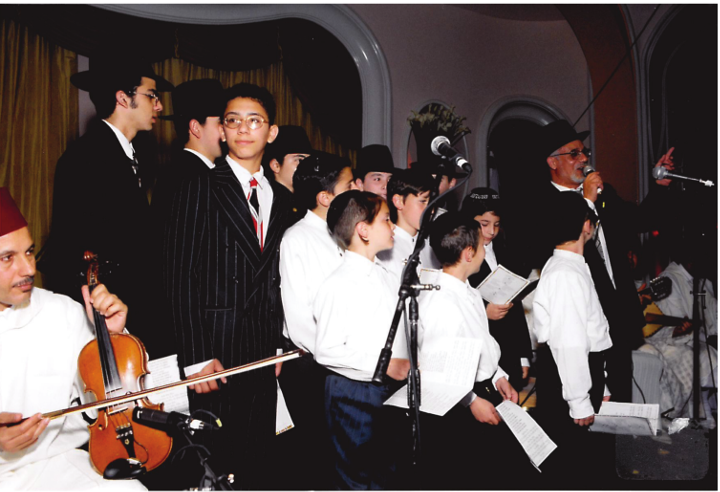 A picture of Rabbi Louk leading a children's choir in traditional Moroccan melodies at a banquet in 1998 in Los Angeles with a band who flew in from Morocco. Photo by Rabbi Joshua Bittan. Courtesy of the author. Moshe (I use a pseudonym) came to the United States in the late 1990s after a long life in Montreal, Canada. In 2016, we met in a café in the Fairfax district, where he introduced me to the history of the Moroccan Jewish community of Los Angeles. Before we said our goodbyes, we stopped at the neighboring synagogue of Baba Sale, one of the main Moroccan houses of worship on Los Angeles's Westside. While we talked about his life growing up in the mellah (Jewish neighborhood) of Marrakesh, he began to reflect on spatial restrictions and how they influence national and religious identities. "For many Moroccan Jews, including the ones who live in Los Angeles, there is a strong belief that the mellah is a discriminatory space that restricted Jewish movement in Islamic cities," he noted. After a moment of silence, he added: "Yet, while I believe that there is some truth in this statement, I also think that the mellah as a Jewish space helped Moroccan Jews throughout centuries nurture and maintain a distinct and independent Jewish identity around their synagogues and rabbis. In Los Angeles, we were able to create our cultural mellahs in the Valley and on the Westside, making sure that our multicultural and linguistic identities are not erased and that our Moroccan Jewish values are transmitted to our children." This picture was taken in 2014 at the 40th anniversary banquet of Em Habanim synagogue. 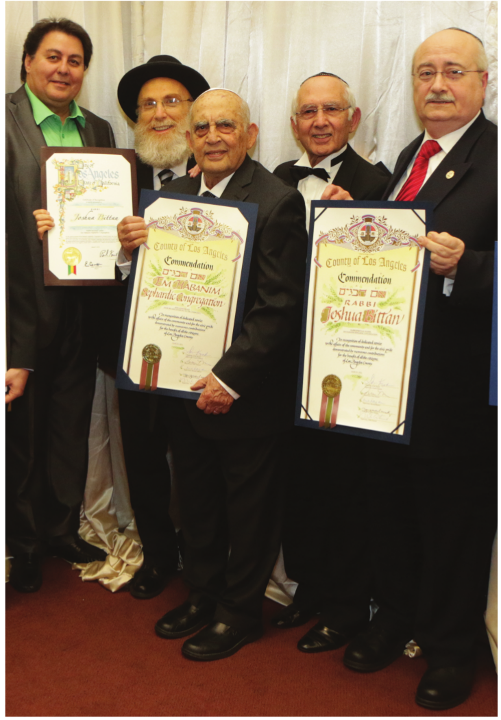 Pictured from left to right Aime Oiknine, Rabbi Joshua Bittan, Sidney Chriqui, Andre Chriqui, and Los Angeles County Commissioner Howard Winkler. Photo by Rabbi Joshua Bittan. Courtesy of the author. This ethnographic anecdote points to a number of themes at the center of a growing fluid and global Moroccan Judaism. It was surprising to me, given the negative and ahistorical views about the mellah as a "closed and walled space," to hear a Moroccan Jew who lives in Beverly Hills talk about pockets of Moroccan Jewish communities as modern mellahs of Los Angeles. Despite the negative aspects of the term, Moshe takes an iconic local term that in many ways stands as a synecdoche for what it means to be a Moroccan Jew, and gives it a positive meaning in a new context where he feels that Moroccan Judaism is (un) consciously stigmatized by other ritual expressions of Judaism. This is a Judaism that defines itself as unique and aspires to maintain its Moroccan indigeneity even in the context of global metropolitan centers where it is naturally dwarfed by dominant Ashkenazic Jewry and engulfed by Sephardic Jewish traditions from Iraq, Greece, Turkey, Tunisia, Syria, and Rhodes, as well as Persian traditions from the large Iranian Jewish community. For Moshe and many others, Moroccan tradition becomes a refuge and a safeguard from other religious influences. Since the late 1980s, Moroccan Jewish immigrants continue to arrive in Los Angeles mostly from Israel, France, and Canada. Locally viewed as part of the larger Sephardic Jewish community of Greater Los Angeles by other Jewish communities, Moroccan Jews constitute a group estimated to be about 10,000; a large part of the community is represented by Moroccan-born Israelis. Therefore, while many Moroccan Jews settled in Los Angeles directly from their native towns and cities in Morocco, other immigrants came after one or many short and/or long stops in Europe, Canada, and Latin America. I became interested in the global circulation of Moroccan Jewish identity as part of a larger historical ethnography of Moroccan Jewish migration from Canada, France, and Israel to the United States; from Venezuela to Miami and Panama; and from France to Israel. While this trend of circulation is influenced by economic and political factors that have attracted scholarly attention, little research has been done on how Moroccan Jews have adapted to American society and interacted with other forms of Judaism and Jewish communities in the United States. Although we know a lot about the Moroccan Jewish presence in Europe and Canada, little research has been done on the dynamics, characteristics, and settlements of Moroccan Jews in Latin America and the United States. Based on ethnographic research among Moroccan Jews in Los Angeles, I argue that despite centuries of Moroccan emigration and settlement in the Americas and forces of assimilation to local cultures, Moroccan Jewish immigrants have been able to preserve different aspects of Moroccan cultural identities even as they moved around Buenos Aires (Argentina), Caracas (Venezuela), São Paulo (Brazil), and Los Angeles (USA) by maintaining closed social, religious, indigenous Moroccan institutions— notwithstanding personal conflicts between their members. In their mobility between American urban centers, Moroccan Jews continue to embody affective and sensual memories of Moroccan spaces and cultural heritage. At the center of their social memory is the maintenance of Moroccan Jewish Orthodox traditions and a deep connection to their holy men. At the same time, their construction of a Moroccan American Jewish identity has been nurtured by a perpetual, atemporal, and sensuous collective relationship with a timeless "imagined" Moroccan space that exists in opposition to other Sephardic Jewish identities that exist in Los Angeles, including identities built on group migration from Turkey, Syria, Iraq, Persia, and Lebanon. A number of Moroccan Jews arrived in Los Angeles after their exposure to American soldiers in the aftermath of the American landing in Casablanca during the denouement of the Second World War. At that time, Moroccan Jews worked for the American army as translators and civilian workers. One of the early immigrants was Sydney Chriqui, who made it to Los Angeles after serving in the American army in Morocco and France. In his personal biography As Time Goes By: A Life Journey from Casablanca, Chriqui describes how he first got his job with the US Army and settled in Los Angeles. During a personal interview, he noted how he was inspired to build an independent Moroccan Jewish center of worship in Los Angeles. In the early stages of settlement in the city, the Moroccan Jewish community was largely scattered in the Westside district of the city and far from the San Fernando Valley; members of the community attended services mostly in Sephardic synagogues such as the Sephardic Temple Tifereth Israel and the Sephardic Hebrew Center, despite the fact that these communities did not adhere to many Moroccan Jewish Orthodox rites of worship. After many years without a Moroccan house of worship, the community managed to establish its first Orthodox synagogue, known as Em Habanim (Mother of the Children). The synagogue facilitated the creation of the first Moroccan Jewish community in Los Angeles. Religious music and melodies are at the center of the birth and revival of Moroccan Jewish communities in Los Angeles since the 1970s. During a Shabbat dinner at the house of one member of the community, a Moroccan Jew noted that "the prayer melodies in Ashkenazi synagogues in Pico-Robertson [a Jewish neighborhood] are foreign to my ears. I feel closer to the melodies in a mosque than to those of an Ashkenazi synagogue." This vignette highlights the importance of lyrics and songs of praises of God (bakkashot) that are similar to Muslim prayers, which many Moroccan Jews used to hear in Morocco. Born and raised in Morocco, Rabbi Haim Louk embodied for years this spirit of the performance and preservation of Moroccan Jewish tradition of singing piyyutim in Hebrew and Arabic in Los Angeles. Even though he lived in Israel and England for years, Louk became a key figure at Em Habanim Synagogue, where he performed traditional religious songs and music. At the same time Louk encouraged the community to expose the younger generation to liturgical melodies and Andalusian music. By the 1990s, Haim Louk, who served as a rabbi of Em Habanim for about fourteen years, became a symbol of Jewish-Muslim relations by singing for Jewish audiences in Los Angeles and Moroccan fans in Fez and Essaouira in the years before he settled in Israel. Nowadays, Em Habanim Sephardic Congregation, under the spiritual leadership of Rabbi Joshua Bittan, is intent on preserving its typical Moroccan heritage in liturgy and customs. The synagogue boasts an active Sephardic Community Center with youth activities, a resource library of religious books authored by Moroccan rabbis, and a weekly meeting of cantors and amateurs from the community at large who gather with Hazzan Shimon Sibony to practice and sing the old tradition of bakkashot. The Moroccan Jewish community of Los Angeles is split in three ways—French, Israeli, and, especially among the young, American. First, there are those who never moved to Israel, but went to France and Montreal. They speak French in synagogues; their Hebrew accent when they pray is more French. Second, there are those who came directly from Israel. They have altered some Sephardic-Moroccan melodies to the point that their prayer style is known as Yerushalmi. During the high holidays, when local rabbis bring in singers from out of town to lead the prayer services, there is a little tension between these groups over the classic vs. Yerushalmi style. Finally, the third group consists of the younger generation that speaks neither French nor Hebrew in synagogues, but American English. They generally do not distinguish between classic and Yerushalmi. The bigger question for this group is to what extent they will continue the rituals of the mellahs, and, for that matter, the very rituals of Moroccan Judaism. Since the middle of the twentieth century, Morocco has witnessed a process of Jewish emigration from its cities and villages. Today the majority of Moroccan Jews are dispersed throughout the world. While the largest number of Moroccan Jews continue to live in Israel, about 100,000 Moroccan Jews live in the Americas. These populations have not only thrived in their respective communities. They have managed to retain their own cultural and religious identities without losing their linguistic and religious complexities. They speak French, Spanish, Berber, Darija, and English. They eat couscous, matbuha, harira, tajines during Shabbat. Their prayers are incomplete without maqams in Hebrew and Moroccan Arabic. Their homes are full of Moroccan cultural artifacts and memorabilia. Aware of the secular and Ashkenazic influence of Los Angeles, many Moroccan Jewish interviewees underlined their confidence in bringing up a new generation of Moroccan-American Jews in Los Angeles. 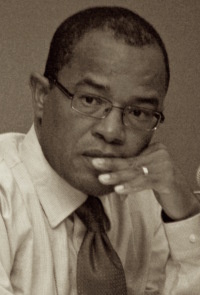 Aomar Boum is an associate professor in the Department of Anthropology at the University of California, Los Angeles. He is interested in the place of religious minorities such as Jews, Baha'is, Shias, and Christians in post-independence nation-states. He is the author of Memories of Absence: How Muslims Remember Jews in Morocco (Stanford University Press, 2013).